has been a heated debate for decades. 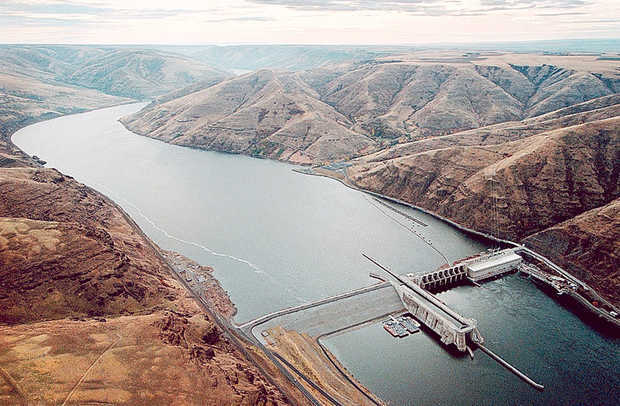 Some Eastern Washington lawmakers want the Snake River Dams to stay in place. They've crafted a bill to leave the dams as they are -- in response to a federal judge's order to consider removing the dams to protect salmon. The bill, H.R. 3144, is expected to be voted on by the U.S. House this week. "Our legislation will keep in place the current collaborative framework that fosters fish recovery efforts while balancing the many economic contributions of our dams," said Reps. Cathy McMorris Rodgers and Dan Newhouse in a joint statement. Two years ago, a federal judge said the government was not doing enough to protect salmon. He wanted dam managers to think One option he asked dam managers to thoroughly consider was removing or altering the four Lower Snake River dams. "Despite billions of dollars spent on these efforts, the listed species continue to be in a perilous state," U.S. District Court Judge Michael Simon wrote. "The (Federal Columbia River Power System) remains a system that ‘cries out' for a new approach." Breaching the Lower Snake River dams in southeastern Washington has been a heated debate for decades. And now, instead of debating it, several lawmakers want that option off the table. They've introduced legislation that would keep the federal government's dam management plan (called the biological opinion and referred to in shorthand as a "bi-op" -- rejected by Judge Simon) in place until 2022. Eastern Washington Republicans McMorris Rodgers and Newhouse say the dams are too important for agriculture, navigation and energy. "Rejecting the bi-op only hurts the people of Washington state and sets us back decades in our fight to protect fish and support clean energy," Newhouse said at a press conference in the Tri-Cities last month. A recent study by an energy advocacy group suggested that the dams could be replaced by renewable energy -- making this less a decision about energy, they said. Hydropower supporters say replacing the dams would mean more of the Northwest's power would have to come from fossil fuel sources, like natural gas. This legislation would also overturn Judge Simon's decision to increase more spill over eight Columbia and Snake river dams. Simon ordered the Army Corps of Engineers to spill more water overtop the dams to help juvenile salmon that migrate out to the ocean. An appeals court recently affirmed Simon's order to increase spill over the dams from April to mid-June. Opponents of the bill say it bypasses the judicial process and undermines the Endangered Species Act. "Congress should focus on actually helping this species recover, not undermining this process through backwards legislation not based on sound science or robust public processes. I will vote against this bill if it comes to the floor, and I urge my colleagues in the House and Senate to do the same," said Rep. Earl Blumenauer, D-Ore., in a statement. Environmental groups also strongly oppose the bill. "This legislative proposal is misguided, counter-productive and based on an extremely poor understanding of the plight of our salmon and any realistic changes to how Columbia Basin hydro-system would operate to better protect salmon," said Bill Arthur, Sierra Club Chair, Columbia-Snake River Salmon Recovery Campaign, in an earlier statement.